I have finally recovered enough from my dreadful cold that I can TASTE things again! Joy! Ice cream is infinitely more enjoyable when it tastes of something other than iciness, let me tell you. If you are enjoying Grassblades (and I really hope you are!) I invite you over to my Patreon, where backers are always two pages ahead of everyone else, and are getting to see excerpts from my Enough Space for Everyone Else-submission, and my sideproject Cigarette Fireflies, and anything else I get up to. If you wanna get your hands on other comics I’ve made, but don’t feel like signing up for a higher tier pledge on Patreon (though please do consider that; it’s totally worth it, and it will also keep me in fresh tea and helps pay my bills), you could always buy hi-res PDFs of them over on Gumroad! I’ll be adding new ones as I go, and they’re all loaded with shiny extra material – and every chapter of Grassblades will be for sale there, with aforementioned shiny extras, whenever they wrap up here. 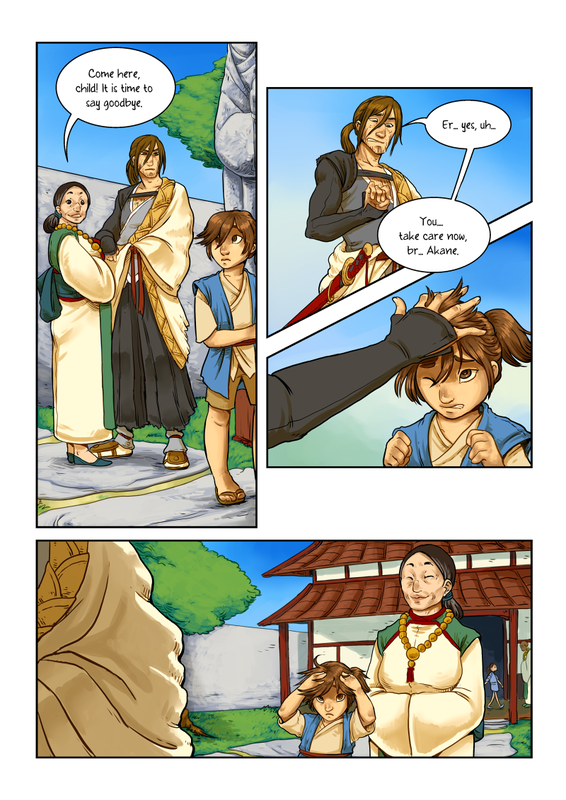 Yup, I am a webcomic magician! XD Thanks for reading, Leo – I’m glad you’re enjoying it. Akane doesn’t like having her hair ruffled, huh? Reminds me of a face of dropping a stray cat at the shelter. It’s random but I really like the design of that lady’s costume.